Helen Thorsen has a BA in Dance from Columbia College, with an emphasis in contemporary dance & dance therapy. She has a background of study that includes Butoh, Graham technique, Effort/Shape Laban dance, Yoga, Tai Chi, Skinner Releasing, Ballet and Pilates. Her work is grounded in universal principals of open heartedness, acceptance and presence. Thorsen was Artistic Director of 627 Space in Chicago. She was also a founding member of Yuni Hoffman Dance Theater and Dappin’ Butoh in Seattle. Her choreography has been viewed widely in Seattle and Chicago. With Mary Cutrera she co-founded LastLeg Dance , which produces their choreography and supports emerging dance and aerial art in Seattle. Ms. Thorsen is managing director of DAIPANbutoh Collective. She has studied contemporary dance with Karen Steele, June Finch, Jan Batoszek, Shirley Mordine, The Alwin Nikolais Company , The Graham Company, Bill T Jones and others. She performed in Bill T Jones Uncle Tom’s Cabin in 1995. 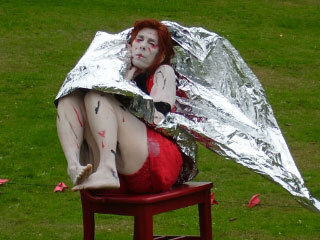 She began her study of Butoh in 1981 with New York artists Eiko and Komo. After moving to Seattle she began Butoh practice with Joan Laage dancing with Dappin’ Butoh, for 9 years. She received an Illinois Arts Council grant and award for her choreography “Tango”, smART Ventures Grant from The Mayor’s Office of Arts & Cultural Affairs.